The Acropolis Museum's lucky charm for 2019 takes inspiration from one of the decorative details of the architecture of the first large temple of Athens, the Hekatompedon. Whether or not you believe in lucky charms, the Acropolis Museum's charms and other Christmas themed items for 2018/2019 make for perfect gifts. It’s the most wonderful time of the year. If you feel like we’re making that statement a bit too early, you haven’t considered Christmas shopping. Now is the time to start searching for thoughtful presents for your loved ones, and the stores are way ahead of us. 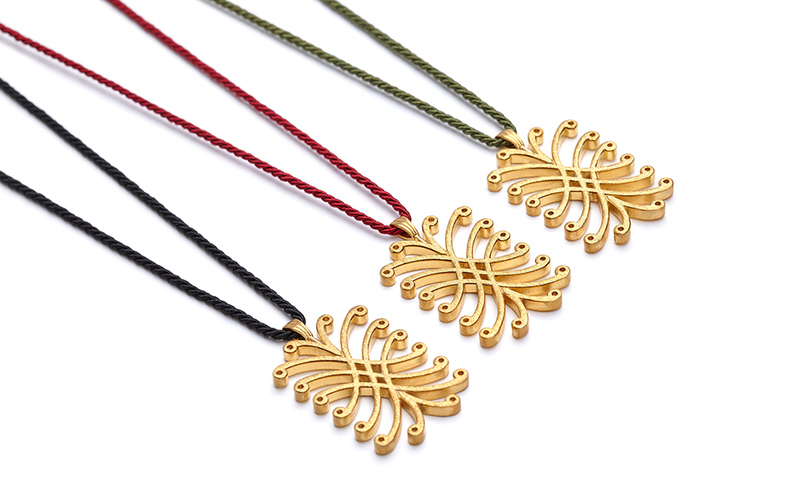 One great gift that’s always appreciated is a “gouri” – a lucky charm (read more about Greek lucky charms here). 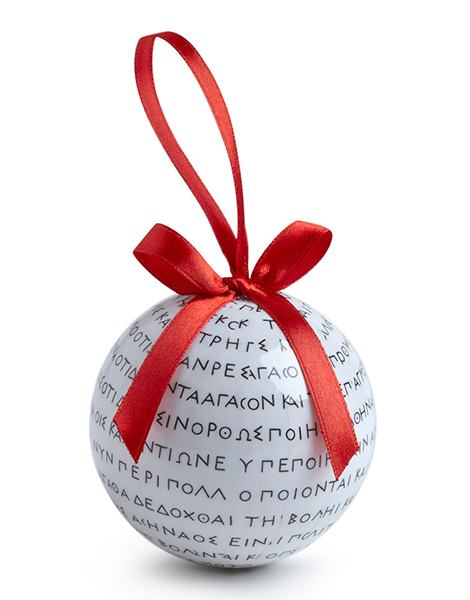 Every year, one of the things to look forward to is the Acropolis Museum’s presentation of their Christmas ornaments and lucky charms for the new year. Last year, the lucky charm design featured myrtle, inspired by a wreath pictured on a ca 1st c. AD marble plaque that is on display in the museum, and which bears the inscription “Agathe Tyche” or “good fortune”. Porcelain wheel inspired by a small brass wheel from 6th c. BC (on display in showcase 19 of the Archaic Gallery on the first floor of the museum). 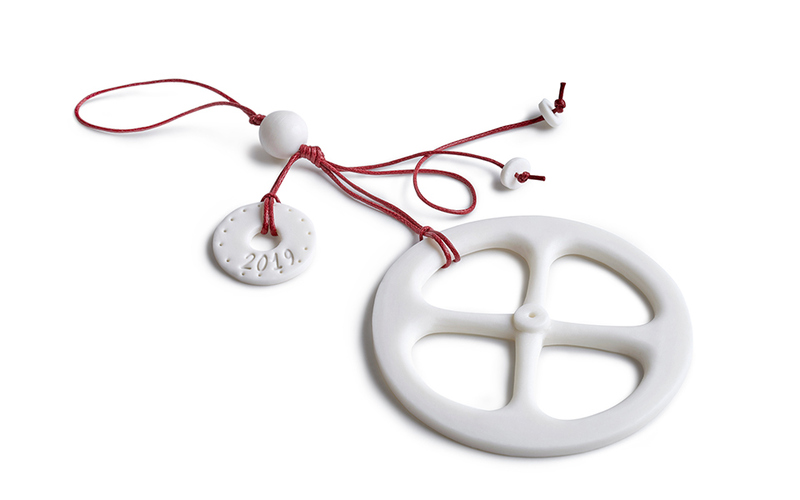 The lucky charm for 2019, designed by Kostas Dimopoulos, takes inspiration from one of the decorative architectural details of the first large temple of Athens, the Hekatompedon (early 6th c. BC). The construction of this first grand “Parthenon” signified the beginning of the great dominance of the city of Athens. Parts of it are on display in the Archaic Gallery on the museum’s first floor. The decorative detail consists of painted palmettes and lotus flowers. 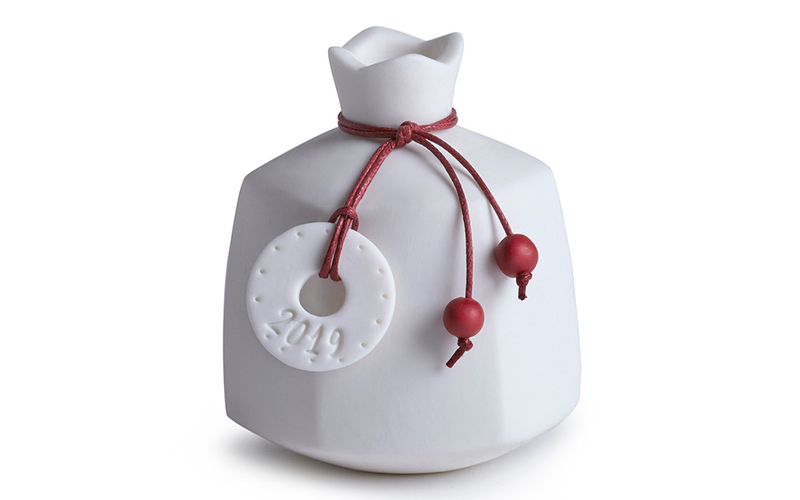 Contemporary ceramic pomegranate is inspired by that held by an Archaic Kore from 580–570 BC, found in the Archaic Gallery on the museum's first floor. Another popular charm decorating the coffee tables of most Greek homes – at least during the beginning of the year, are glass or ceramic pomegranates, traditionally associated with fertility and abundance. The museum’s version, designed by Treis Grammes Ceramics, is white ceramic, and inspired by that held by an Archaic Kore from 580–570 BC, found at the Erechteion temple on the north side of the Acropolis and now displayed in the Archaic Gallery on the first floor. Ornament inspired by the marble horses of a metope of the Hekatompedon. Ornament inspired by an inscription from 405/4 BC. Other decorative items to gift this year are two other creations by Treis Grammes Ceramics – an ornamental ceramic ball decorated with geometric designs inspired by the ceramic vessels from the Geometric Period (9th – 8th centuries BC), and a porcelain wheel made to the image of a small brass wheel from the 6th c. BC. 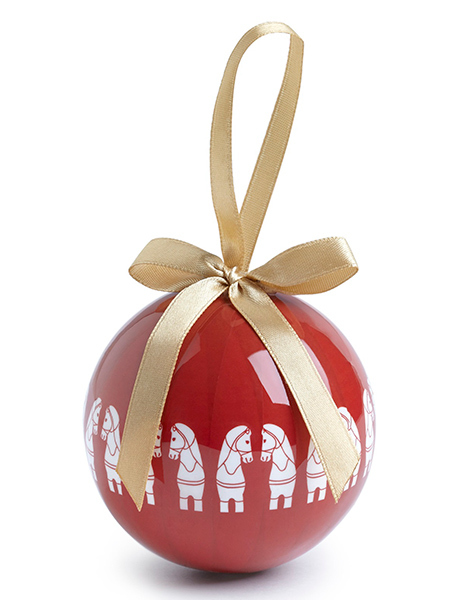 You’ll also find two beautiful ornaments designed by Prepack – one with a horse design inspired by the marble horses of a metope of the Hekatompedon, and the other by an inscription from 405/4 BC in which the city of Athens pays tribute to its ally, the island of Samos. All items are available for purchase at the Museum Shop on the ground floor. Opening hours: Monday-Thursday 9.00 – 17.00 with last entry at 16.30, Friday 9.00-10.00 with last entry at 21.30, Saturday & Sunday 9.0020.00 with last entry at 19.30.